Having a dog that can not only be a family companion, but a protector can bring you piece of mind and security. A personal protection level I dog is trained to protect you and your family on command. The dog is trained to bark and hold and keep a threat at bay, while primarily acting as a deterrent to would be assaulters. A personal protection level II dog is trained to bite on command and release on command when handler is near the dog. A personal protection level III dog is trained to bite and release on command and can be sent out to bite and release on command from a distance. 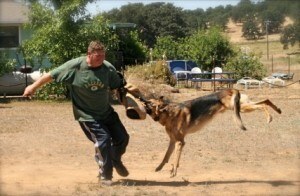 Personal Protection Training is available for German Shepherds and other breed at the German Dog Training Center. Serving Sacramento, Yuba City, Marysville, Roseville, Folsom, Woodland, Davis and Elk Grove.